NL Crime Stoppers thanks Pyramid Construction for their continued support. 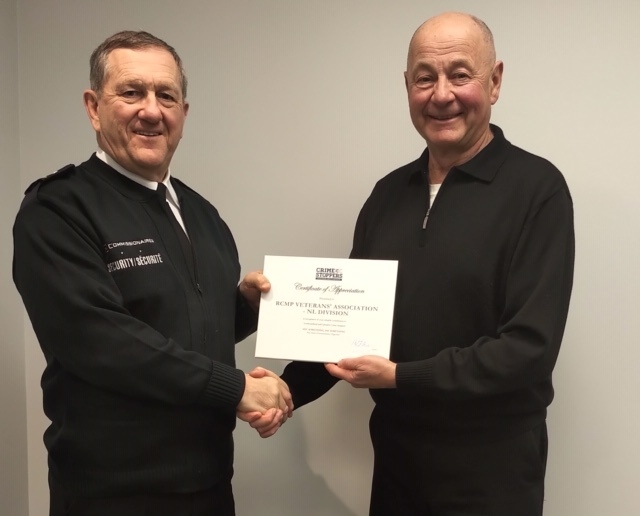 Crime stoppers Board member Retired S/Sgt. Randy Mercer presents a plaque of appreciation to Mr Wilf Curran. NL Crime Stoppers presented an award of appreciation to the NL Division of RCMP VETERANS for their donation and continued support of our program. Pictured: Mr Leo O’Brien, president of NL DIVISION of RCMP VETERANS and retired S/Sgt. Randy Mercer of the NL Crime stoppers board. 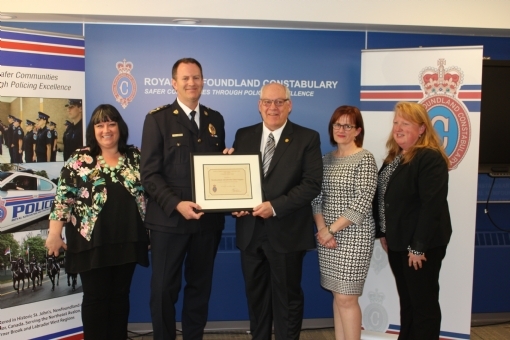 Plaque presented by Mark Brown (Board Chair) and Cindy Wadden of NL Crime Stoppers to Dermot Flynn, chair of MMSB Board along with staff and board members. 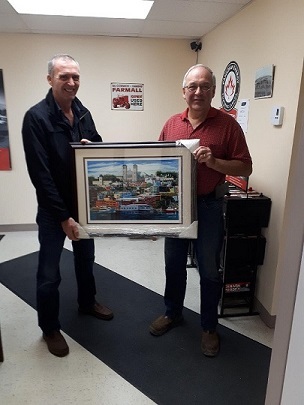 Congratulations to Wayne Vallis, winner of the "City of Colour" print donated by artist Glenn Clarke and presented by Crime Stoppers Coordinator Bill Day. 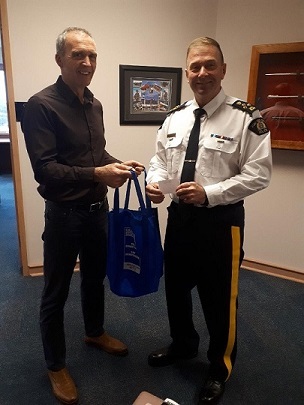 Special thanks to our volunteers for their fundraising efforts in support of the Crime Stoppers program and to RCMP Assistant Commissioner Ches W. Parsons who assisted with the draw. MEDIA RELEASE - CALL FOR NOMINATIONS! February 6, 2017 - Nominations for the 2017 Police and Peace Officer of the Year Awards (POYA) are now being accepted. Coordinated by Newfoundland and Labrador Crime Stoppers, POYA is an annual awards program that honours enforcement officers in Newfoundland and Labrador that perform beyond the call of duty both on the job and in the community. Nominations are open until March 20, 2017. Newfoundland and Labrador Crime Stoppers is a civilian, non-profit, charitable organization that provides citizens with a vehicle to anonymously supply provincial enforcement agencies with information about a crime or potential crime of which they have knowledge. Cash rewards are offered to people who provide information that leads to an arrest. January is Crime Stoppers Month! January 26, 2017 – The Honourable Andrew Parsons, Minster of Justice and Public Safety and Attorney General, Government of Newfoundland and Labrador and Mark Brown, Chair of NL Crime Stoppers, proclaim January 2017 Crime Stoppers Month for the province of Newfoundland and Labrador. “On behalf of the Government of Newfoundland and Labrador, I would like to recognize Crime Stoppers Month and congratulate our local chapter on 25 years of dedicated service to the people of the province. This month is an opportunity to raise awareness of this valuable collaborative and community effort and thank the organization for all their hard work,” said Minister Parsons. Crime Stoppers is a charitable organization that for 25 years has provided the people of Newfoundland and Labrador with a vehicle to anonymously provide information about a crime or a potential crime of which they have knowledge. 2016 shows more than 2221 TIPS received – resulting in 82 arrests, 130 charges and almost $412,416 in goods recovered. Since the start of the program in 1992, 3,602 charges were laid with more than $9.1M in goods recovered. Started in 1992, and celebrating 25 years of service in this province in 2017, Newfoundland and Labrador Crime Stoppers is a community-based program and registered charity. It brings the public, media and law enforcement agencies together in cooperative effort to help solve crime by offering cash awards and guaranteeing anonymity to persons who furnish information leading to the arrest or laying of charges against criminal offenders. EDITORS PLEASE NOTE: Photo from the proclamation signing attached. May 27, 2016 – Newfoundland and Labrador Crime Stoppers today presented the 2016 Police and Peace Officers of the Year Awards (POYA). The ceremony was held at the Manuels River Hibernia Interpretation Centre with finalists and family members, executive from the respective executive organizations and invited members of the community. “Newfoundland and Labrador Crime Stoppers takes pride in honouring officers in our province that go above and beyond the call of duty in their service to the community. Courtesy, kindness, understanding, compassion, courage and devotion to duty are key qualities required in police officers in their normal duties. The nominees and recipients of 2016 Awards exemplify these characteristics, and we are pleased to recognize these individuals for their outstanding achievements,” said Mark Brown, Chair of NL Crime Stoppers. The 2016 Police and Peace Officer of the Year Awards are proudly supported by the VOCM Cares Foundation. Newfoundland and Labrador Crime Stoppers and Newfoundland and Labrador Crime Stoppers North East Avalon Branch were nominated for the Chief of Police Citizens Recognition Award by Cst. R. Robinson. 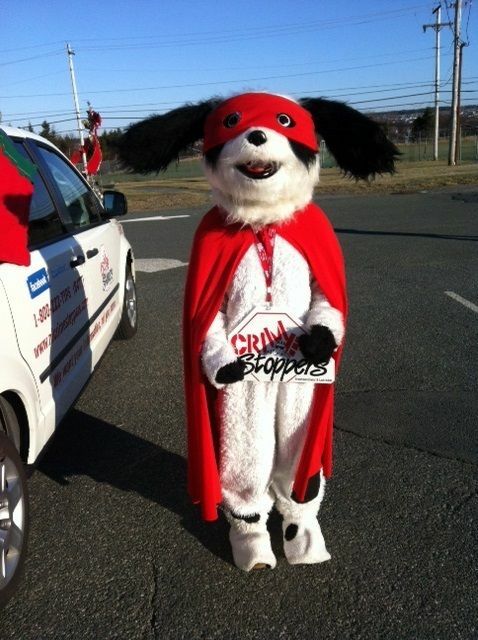 Newfoundland and Labrador Crime Stoppers is a community-based volunteer organization and a registered charity. They began in October of 1992 with one branch in the St. John's area, the North East Avalon Branch. Since that time, Crime Stoppers has expanded to ten branches which are located throughout the province. Crime Stoppers presently has in excess of 150 volunteers comprised of many diverse, active and dedicated community representatives. Crime Stoppers provides a method for local law enforcement and other investigative agencies to receive information on crimes. The efforts of Crime Stoppers increase tips on crime, which in turn increase arrests in our community. As of January 18, 2016 Crime Stoppers activities have resulted in 2,614 arrests being made, 3,838 cases which were cleared and $270,950 in rewards paid out for tips received. In addition to this they had $3,454,224 in property recovered and $7,197,829 in drugs seized. Other programs of Crime Stoppers in Newfoundland and Labrador include; Police and Peace Officer of the Year Awards, the School Program and the Illegal Dumping program. One of the primary functions of this team of volunteers is to raise the level of awareness of Crime Stoppers throughout Newfoundland and Labrador. They regularly attend community events in an effort to provide information about Crime Stoppers and how it works. To help raise awareness in 2015, the North East Avalon Branch of Crime Stoppers hosted a very successful RCMP Musical Ride this past August at the Mount Pearl Intermediate School Soccer Field. As a result of exemplary dedication and thanks to the countless hours of volunteer time put forth by the Crime Stoppers Volunteers Newfoundland and Labrador is and continues to be a safe place for all citizens to live and raise their families. 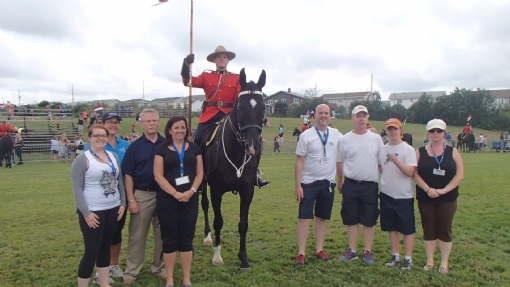 NL Crime Stoppers, North East Avalon Branch hosted the world famous "RCMP Musical Ride" on August 22 and 23rd, 2015 at the Mount Pearl Senior High rugby field . Thank you to everyone who bought tickets and came out to see the shows. Thank you to all of the shows supporters. It was an amazing success !! Event tickets are only 11dollars each including all fees. NL Crime Stoppers is excited to host the RCMP Musical Ride on August 22 and 23, 2015 as part of our ongoing community awareness programs. The ride will take place at the Mount Pearl Senior High sports field off Ruth Avenue at 6:30 pm on August 22 and at 2pm on August 23, 2015. This is a great family event, please come out, have fun and support your local Crime Stoppers branch. See you at the field! 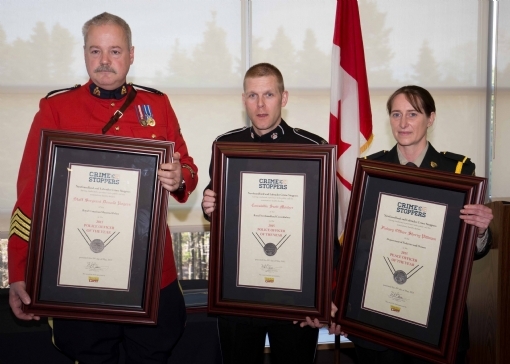 May 29, 2015 – Newfoundland and Labrador Crime Stoppers today presented the 2015 Police and Peace Officers of the Year Awards (POYA). The ceremony was held at the Manuels River Hibernia Interpretation Centre with finalists and family members, executive from the respective executive organizations and invited members of the community. “For over 20 years, Newfoundland and Labrador Crime Stoppers has taken pride in honouring officers in our province that go above and beyond the call of duty to make our communities and province a better place to call home. Again this year, the awards program represents all the enforcement entities in the province, police and peace officers and we are delighted to recognize these outstanding enforcement officers,” said Mark Brown, Chair of NL Crime Stoppers. 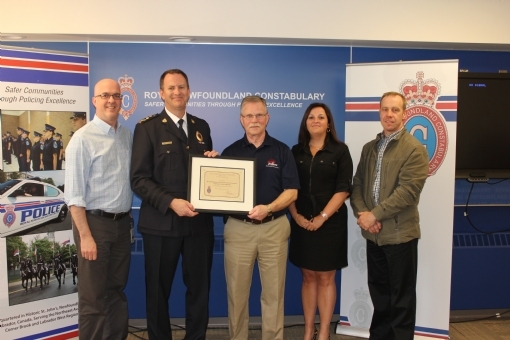 The 2015 Police and Peace Officer of the Year Awards are proudly supported by the VOCM Cares Foundation. 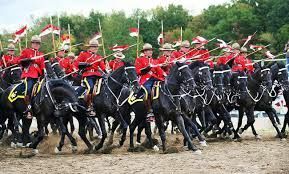 NL Crime Stoppers is pleased to announce that we will be hosting the RCMP Musical Ride on August 22 and 23, 2015 as part of our ongoing community awareness programs. Tickets will be available shortly both online at Ticket Pro and locally at service stations in St. John's and Mount Pearl at a cost of 10 dollars per person. 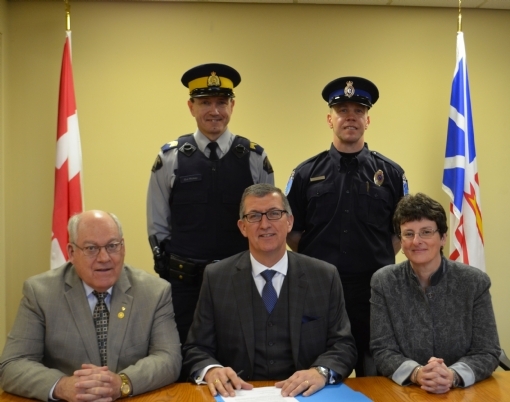 January 21, 2015 – The Honourable Paul Davis, Premier of Newfoundland and Labrador and Mark Brown, Chair of NL Crime Stoppers, proclaim January 2015 Crime Stoppers Month for the province of Newfoundland and Labrador. 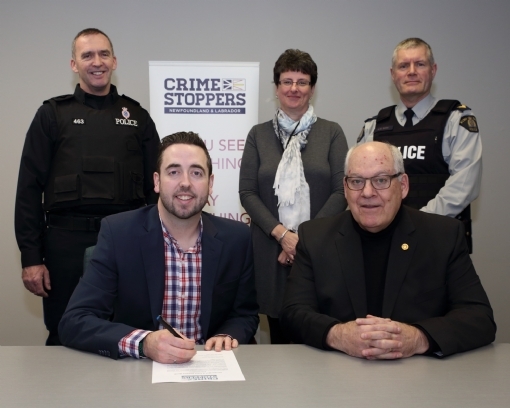 “On behalf of the province of Newfoundland and Labrador, I am pleased to extend support in the marking Crime Stoppers Month and in the promotion of the organization’s hard work. Crime Stoppers Month is an opportunity to raise awareness of this valuable collaborative and community effort,” said Premier Davis. arrests, 44 charges and almost $200,000 in goods recovered. Since the start of the program, 3288 charges were laid with more than $7M in goods recovered. persons who furnish information leading to the arrest or laying of charges against criminal offenders. Rescued from an illegal Puppy mill in Newfoundland many years ago, a young sheep dog pup grew up strong, loyal and courageous. Wanting to help others and dedicated to stopping illegal activity all over Newfoundland and Labrador the young dog adopted a new identity and spends his days traveling throughout Newfoundland and Labrador stopping criminal activity wherever it exists. let us introduce "TIPPER" the crime fighting super dog. 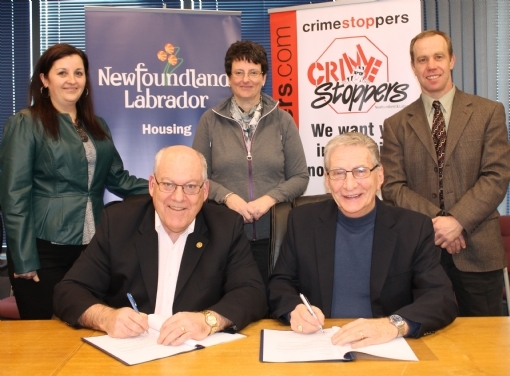 Crime Stoppers Newfoundland and Labrador recently accepted a cheque from NL Housing Corporation in the amount of 5000.00 to assist in developing a partnership that will see Crime Stoppers assist in helping prevent crime on properties owned by NL Housing. Thank you to NL Housing for your support of Crime Stoppers.